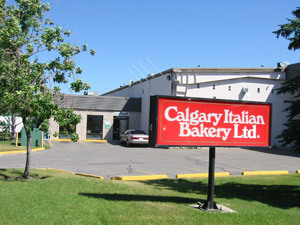 The Calgary Italian Bakery Ltd. is one of the largest and most significant independent bakeries in Western Canada. Luigi and Myrl Bontorin founded the company in 1962 and the success of the enterprise did not happen by accident. It is the result of years of dedication to product quality and consistency, good service, and plain old hard work by all 80 staff members of the bakery. Luigi Bontorin, President of Calgary Italian Bakery is quick to point out, “The harder I work, the luckier I get.” This hard work translates into high quality at good prices for customers. Starting out from a small family operation that had Luigi baking at night and delivering during the day in an old Volkswagon station wagon, the bakery’s recipe for success is surpassed only by the taste of its product specialties. In those early days, running the bakery was truly a family affair as Luigi’s wife, Myrl, pitched in by doing the accounting work. The family tradition continues with the addition of sons Louis and David to the firm. Louis is Supervisor of Administration, Sales and Accounting while David manages the Production area. Luigi says that a major part of any successful business is keeping up with the latest changes in businesses and technology, and developing new ideas of your own. We are compliant with BRC (British Retail Consortium), a global food safety initiative and have a recognized HACCP Plan in place. 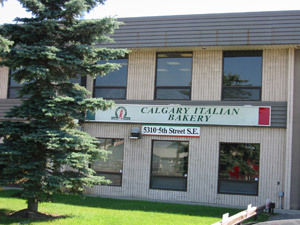 Situated at a 40,000 square foot facility in southeast Calgary, Calgary Italian Bakery has called this 3.8-acre site home since 1981. The bakery provides southern Albertans with a full complement of bakery products. Most of the bakery’s business is wholesale to grocery chains, schools, government agencies, senior’s residences, hospitals and restaurants. Early in 1995, to help diversify its product line, the bakery became one of the only two producers of English Muffins in Western Canada and now ships these, and other products, throughout the west. They also “co-pack” products for other bakeries and wholesalers. The bakery has its production and distribution system operating 24 hours a day to ensure every product sold and delivered is as fresh as possible. Every aspect of production is continually supervised for quality and cleanliness. Product, however, is only half the story with the Calgary Italian Bakery. Our staff value service with an equal zeal. The focus of the sales staff is to work with the customers in building a good base of mutual trust and knowledge of client’s needs. “That’s why you call yourself a salesman”, adds Mr. Bontorin. With its trademark green, red and white trucks as its corporate sales fleet, the Calgary Italian Bakery serves up its baked delights in the greater Calgary area and as far north as Airdrie (see our delivery schedule for more details). This network of delivery and sales personnel is a key tool by which the bakery manages to maintain such high levels of product freshness and consistency. While special orders (whatever their size) may be met easily with only a couple days notice, most orders usually take only one day to accommodate. Calgary Italian Bakery prides itself on being a food “corporate citizen” by contributing to local sports associations, Church and community groups. It is often been said that goodwill gestures such as these are the best advertising of all. Located in the front of the bakery is a public factory outlet & deli retailing the Calgary Italian Bakery’s breads, buns, pastries, English muffins and donuts.